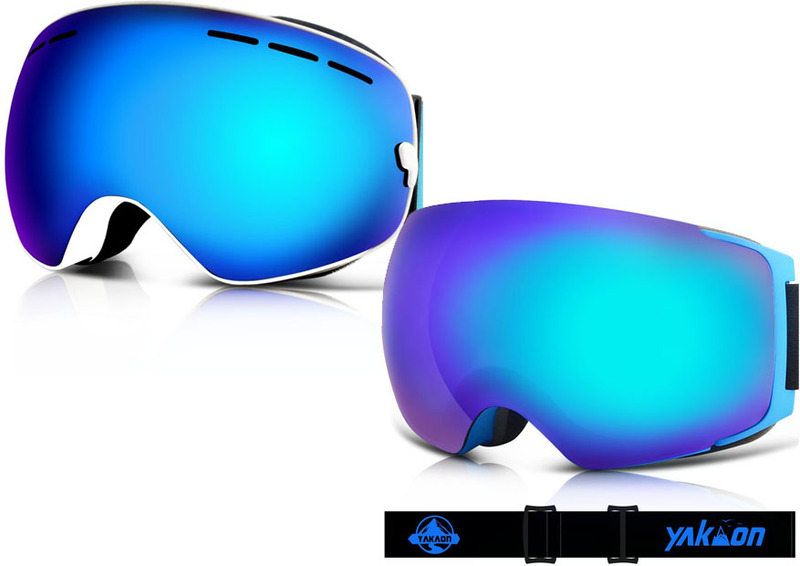 Yakaon Y1 and Yakaon Y2 indeed make very attractive choices when you are looking for a good snow goggle while on a tight budget. These two models are available in an affordable and budget-friendly price range. They are decent for the money, and they work pretty well. They are very comfortable, too. So, what is the difference between Yakaon Y1 vs Y2? See the comparisons between Yakaon Y1 and Yakaon Y2 below and see which one is the best for the money! The first difference between Yakaon Y1 and Yakaon Y2 is about the size. Well, they are actually about as big as each other. They are neither too large nor too compact. Their size is just right to allow good vision without being too bulky or too heavy. However, the design of Yakaon Y1 makes the goggle feel a little bit bulkier than the sibling. This is probably because of the rim design. The rim really surrounds the lens and snatches the sides. On the other hand, Yakaon Y2 feels a little bit slimmer because the rim does not look very pronounced. Let’s not say that the rim is thinner because it isn’t. But the design is simply better and more elegant. Both Yakaon Y1 and Yakaon Y2 are very comfortable to wear. They come with multiple foam layers on their frames. Whichever model that you choose, you can be certain that the fit is nice and comfortable. The multiple foam layers are also beneficial for maintaining heat, blocking wind, and resisting impacts. Both models are also equipped with adjustable anti-slip silicone straps that ensure your goggle stays in place. Each model here comes with the two-way full parameter venting system. This is a unique yet awesome feature. If you take a look at the bottom of the goggle, under the lens, you can find two vent holes through which cold air come in. Above the lens, there is a wide vent hole where hot air from your breathing is exhausted. In other words, the breathability is excellent. Yakaon Y1 vs Y2 provide different field of view. The vision that Yakaon Y1 provides is slightly smaller, and the peripheral vision in the vertical direction is not very good. This is because of the small stripes on the upper part of the lens, which reduce your vision. In addition, this model has a full rim that surrounds the lens, thus limiting the peripheral vision. On the other hand, Yakaon Y2 comes with a fully smooth lens. Unlike the Y1, this model does not have any stripe on the upper part of the lens. The rim also does not block the vision very much. As a result, the peripheral vision especially in the vertical direction is much better. - UV400 Protection and Anti-fog – Featured with special 100% UV400 protection and anti-fog coating. Yakaon snow goggles ensure skiers have a clean vision on all way on slope. - OTG Compatible Ski Goggles – Unique cut on sponge for better compatible with small to medium size prescription glass. - Ultra-wide and Clear View – YAKAON ski goggles comes with panoramic frameless design which provide a larger view for skiers and snowboarders. - Comfortable and Warm – Multiple-layer high quality foam provide good wind-proof and impact-resistance, two-way full parameter venting system enhance the air-flow inside the lens. - 100% SATISFACTION GUARANTEE - All YAKAON snow goggles are designed for both men and women, we provide customer friendly 1 year warranty and swift response customer service. - UV Protection and Anti-fog - The YAKAON Y2 ski goggles for men & women featured with dual-layer lens made of solid PC material which come with unique anti-fogging treatment and 100% UV400 protection that cuts the glare. - Easy Swapping - YAKAON snowboard goggles use 8 spots magnet hold the lens tight and easy to replace for replacement and cleaning, A variety of lenses available. Perfect snow goggles to make your own combination. - Ultra-wide View - More than 180 degree view from this panoramic spherical lens design which provides super clear vision and less visual interference. Two-way ventilation system enhance air-flow and reduce the fogging in warm, moist condition. - Adjustable Strap - Snowboarding goggles use a adjustable longer head strap fit different head size and helmets for Skier and Snowboarder. - 100% Satisfaction Guarantee - All YAKAON ski goggles are provide 1 year guarantee warranty and friendly customer service. In general, between Y1 and Y2, the more recommended model is Yakaon Y2. It has a better design, which allows a better field of view with more peripheral vision. Nevertheless, both models are very comfortable, thanks to the two-way air ventilation system.